I'm breathing a little easier. I think I finally got it all done. October was a wild month- an 8-day missions trip smack dab in the middle of the month surrounded by full time work before and after; an-all day women's workshop event two weeks after our return (with my part having to be cancelled due to the freak East Coast Halloween snowstorm, thank you very much); four college application processes to go through with my high school senior before the end of the month, plus the daily grind of, well, the daily grind. During the craziness, I would come home from my workday and start right in at my home office and work until I needed to sleep. 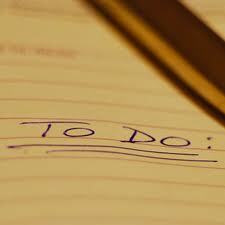 Every day had a list - a long one- of things that needed to be tended to, paid, written, applied for, or called about. But as of last night, it was all done. All the catching up, all the running around, all the phonecalls and bills and applications. And I could look back and say- this free time I have now is truly a gift. I can appreciate it completely because of the burning-the- candle-at-both-ends kind of schedule I had to keep up these past few weeks. And I learned that for a season, I can work at an intense pace and still be nice. Through it all, God gave me grace to handle it. I ran out of hours before I ran out of patience; I had everything I needed just when I needed it; I didn't sweat the small stuff or the big stuff, but instead I barged ahead and kept going figuring it would all work out. It did. God is good. Time to go enjoy my gift! Oh the grace that God so abundantly gives! Even to get through busy times. Thanks for stopping by and commenting, Caroline! Enjoy your gift fully! There is nothing like the gift of time! Thanks Lindsey! You are right - the gift of time (and health) are precious. That's the test right there--learning how to balance it and keep a good attitude in the face of all the blessings God has given you. Even blessings can be tests. Nikole- you are so right about that. Life is all about balance - not about juggling! And attitude is key. Thanks MLH- it's a lesson I keep learning and trying to practice!